Redevelopment of the historic Fiera Campionaria district created an entirely new appearance for the former premises of the Milan Trade Fair. It brings a new landmark to the capitol of the Lombard region: Torre Isozaki. With a height of 202 m, it ranks among the tallest buildings in Italy. A new business and residential district is being built as part of the CityLife-Project. At its centre is a building that sets innovative standards: Torre Isozaki is focussed on sustainability and serves as a symbol for the green approach of the entire CityLife-Project. It is a purely pedestrian precinct that produces zero emissions. The tower is designed for maximum efficiency and located on a 170,000 m² area in the spacious public CityLife-Park. With 202 m height and 53 storeys (including basement levels), 46 of which occupied by office space, Torre Isozaki offers an overall area of 53,000 m² and therefore space for up to 3,800 people. The design for Torre Isozaki was developed by Japanese Architect Arata Isozaki and his Italian colleague Andrea Maffei. Colombo Costruzioni S.p.A., the construction company from Lecco chose Doka as formwork technology partner based on its decades of experience in international highrise projects. "In every aspect Doka met all expectations with respect to absolute requirements of specifications for the method and process of construction developed and implemented by Colombo Costruzioni S.p.A. Not only did Doka's lifting technology demonstrate unusually high performance and efficiency in this undertaking. It also ensures high quality construction and maximum safety while work is performed", confirmed Corrado Caldera, Building Manager of Colombo Costruzioni S.p.A.
Doka Italia supplied automatic climbing formwork and protection screens for this project. The building shell will be completed by mid-year 2014, around three months prior to the originally scheduled completion deadline. The construction method developed by Colombo Costruzioni S.p.A. and fully supported by Doka resulted in the ability to reduce planned construction stage cycle times significantly. 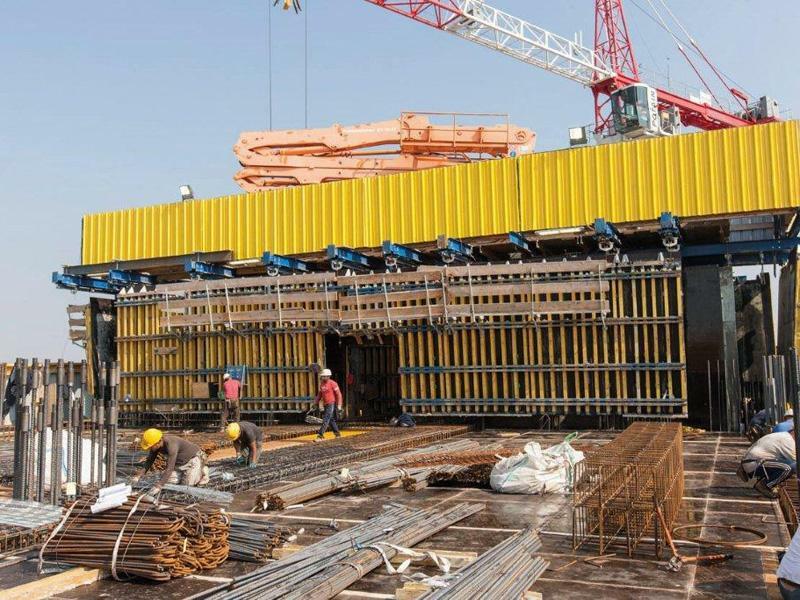 Once more Doka lived up to its reputation as a reliable partner for the construction industry by delivering custom-made formwork technology and efficient services for the respective construction project. 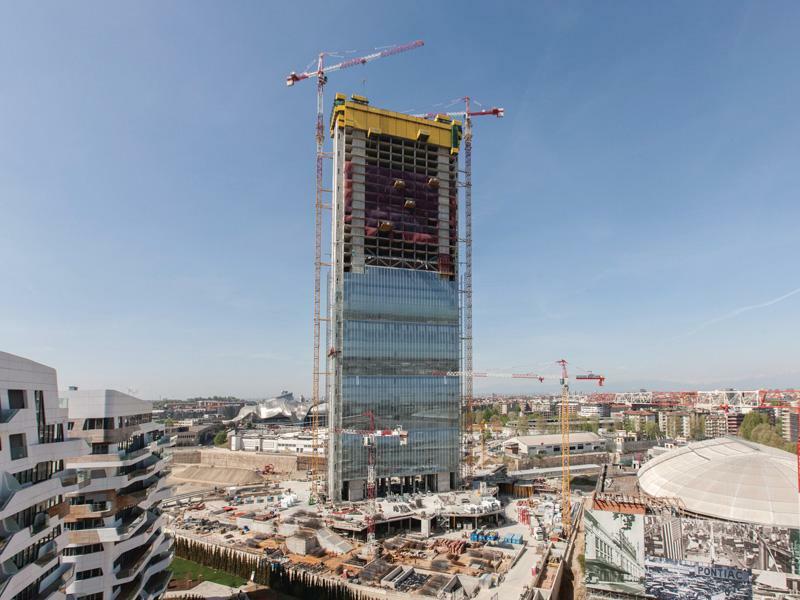 "Torre Isozaki is the first highrise building in Italy where core floors and walls are realised in the same step rather than the core being built beforehand", stresses Massimiliano Guelfi, Engineering Manager of Doka Italia. Surface treatment of fair-faced concrete on the exterior shaft walls for panorama lifts presented a particularly difficult challenge for the Formwork Experts. The panorama lifts built into the exterior walls are arranged between fair-faced concrete areas so as to create a balanced silhouette. While designing the tower, the architect Arata Isozaki placed particular emphasis on the harmonious configuration of continuous facades that were to accentuate the uniform surface symmetry of the building. Integration of the pre-assembled triple bracket, twice angled stairway with intermediate landings constitute another special feature. For this purpose openings above average size in the self climbing unit's platform levels had to be accounted for as early as during the design stage. Doka engineers met this special customer request as well. The resulting advantages for the construction company are easy and quick installation of the pre-assembled stair brackets and the associated optimisation of crane use times. Formwork is raised hydraulically by way of the automatic climbing formwork SKE100 plus. This lifting technology not only raises the formwork but at the same time the concrete placing boom built into the automatic climbing formwork. Thanks to the use of Doka's automatic climbing formwork, the only tasks requiring a crane is lifting the floor formwork and placing the reinforcement steel. Each pouring section is approx. 3.90 m high; the overall cycle time needed for this height amounts to a week on average. The protection screen Xclimb 60 ensures the safety of employees working at any building height; at the same time it guarantees constant building progress even in adverse weather - year-round and without any restrictions. 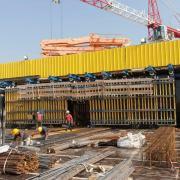 Large-area formwork Top 50 provides the perfect formwork solution for core walls and panorama lift shafts. "Thanks to the reliable engineering of Doka's equipment and the efficient support from the Doka Team on site, we were able to meet the schedule required by Colombo Costruzioni S.p.A. based on a detailed plan for completion. As a result, the original schedule for finishing the building shell was reduced by approx. three months. 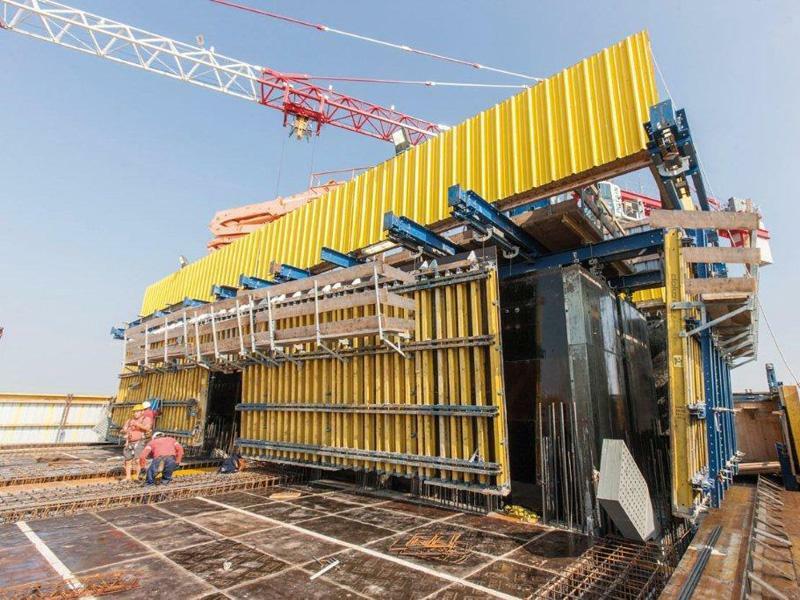 At the same time we were able to realise significant reductions in production costs", explains Gianfranco Cesana, Engineering Manager for Colombo Construzioni. The fact that with its Italian branch Doka is able to offer a high level of expertise and the company's profound know-how in highrise projects on site is truly a unique plus. "Not only does Doka's close network of branches in Italy offer the advantage of a common language. It also facilitates simplified and shortened processes when manpower is required. The result are savings in time and money", stresses Caldera. 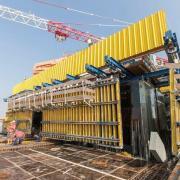 "Still, the aspects that truly won us over were the pre-assembly, adjustment and assembly of the formwork on site. In this regard we banked on the qualifications of Doka employees as industry experts who managed to install the equipment professionally and very quickly." Throughout the assembly work Doka Formwork Instructor Massimo Mazza served as Doka's on-site contact person in charge; as such he was also responsible for proper initial instructions of the building contractor's crew. "We trained the employees in advance on how to use Doka Systems, thereby enabling the construction team to utilise those systems effectively from the very start." In case of questions or when support was needed the Doka Site Assistant was immediately available at any time. The topic of safety in all areas was a deciding factor for Colombo Costruzioni S.p.A. For this reason they used Doka's protection screen Xclimb 60 for this project. The system keeps personnel safe in all stages of their work and ensures that the construction progresses smoothly. Especially challenging in terms of the integrated safety concept were the different shapes of ceiling edges and continuous exterior walls. Doka Engineers developed a specific solution to the problem where work areas and manhole flaps of the protection screens were equipped with variable sealing flaps. This way all openings were safely sealed and the different designs of wall and ceiling edges taken into account. 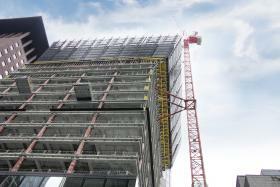 Thank you for your interest - Doka to form Torre Isozaki – one of Italy's tallest buildings. 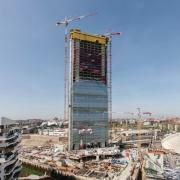 Thank you very much for your interest - Doka to form Torre Isozaki – one of Italy's tallest buildings.